The collect grey shape of bundled figures in the poster, reeked of wet street and tasted copper. 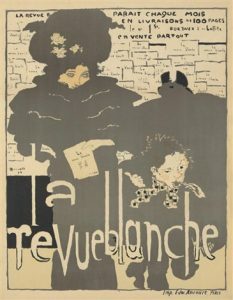 Daughter winced and let the metal tinge salt her tongue, before squinting with fresh focus at La Revue Blanche’ s Ad. As the day was cloudy, yet dry and fairly bright, the scent of damp cobblestones had been at first a bit unnerving. A glimpse of what the overcast was likely planning for the evening, all from a snippet glance at a chromolithograph. Daughter, as quite the wanderer of dense Parisian streets, was used to being accosted by the myriad of storefronts and plastering of posters, as well as by the thrum of conjoined senses in tow with such images. Typically, however, the tastes, smells and sounds accompanying sight where too far flung in their references, and easily dismissed. A lick of sour apple and a shaggy carpet tingling flank green dresses on display. Many other such fleeting melanges. In contrast to these, La Revue Blanche had evoked an initial experience too close to a reality to merely breeze past. She Zeroed in on the urchin boys face, only to receive a tongue-full of shallots when his penned gaze tricked her eyes down his etched, pepper-corn kerchief. She realised the pattern of miniature posters, which scaled the wall behind the depicted figures, carried a similar nightshade aftertaste, and vowed she wouldn’t look long, as she couldn’t stand the taste of anything akin to onion. It was at this moment, that she noticed the face of a woman peering out beneath a blink of hat and shawl. 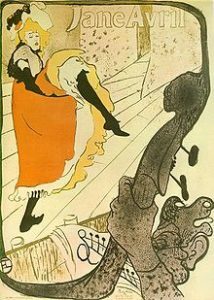 The warm Ivory tint of her skin, and of the flowers adorning the broad-brim she wore above, recalled the dry taste of stockings, as gripped between teeth while worrying about some other garment. The woman’s eyes were witty and expectant, though mostly subtly so, and Daughter realized her week’s predicament had been summarized in sensory by a printed paper. Her eyes widened in acknowledgement of the posters feat, and she dodged right up to the piece in search of the signature. “P Bonnard” she repeated to herself as she stole away towards the grocers, wondering how the man could have predicted her conundrum, and imbued it so cryptically into his work. “Perhaps former- father could introduce me to this fellow” she thought. 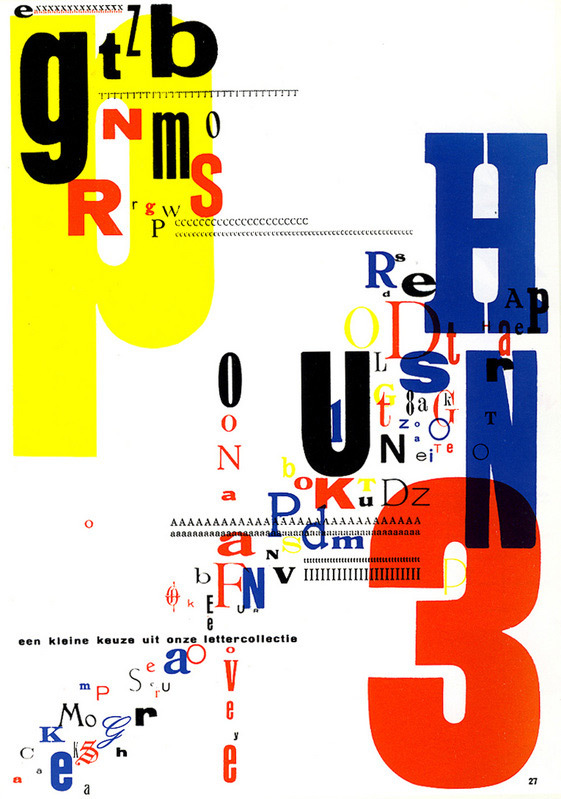 This work is the inside page to the ‘Trio-Reclameboek’ created by Piet Zwart during 1931. For this work, he tried some new typographical ways with different shapes, sizes, and typeface. When I see this work, I could hear the incredible electric piano playing with rhythmic drums, the fronts and numbers with different sizes are pictured in front of my eyes like dancing in the cave while the piano being played. The perfect genre that the music would fit in between pure music and Jazz Hip-hop. It looks very colorful and rich even there are only have the primary colors, and the circular compositions created by those special fronts could lead the viewer’s eyes to follow these particular circles by using different size characters. This is very similar to Jazz hip-hop’s simple and repeating melody but doesn’t sound boring. And here is an example of my synthesia about this work. The world was changing rapidly in the nineteenth century, and it had profound effects on art and design. With new materials and techniques available for use, artists began to explore new forms of production, looking into the world of photography. Through their encounter and exposure to movements like Cubism and Fauvism, American Modernism was inspired and begun. 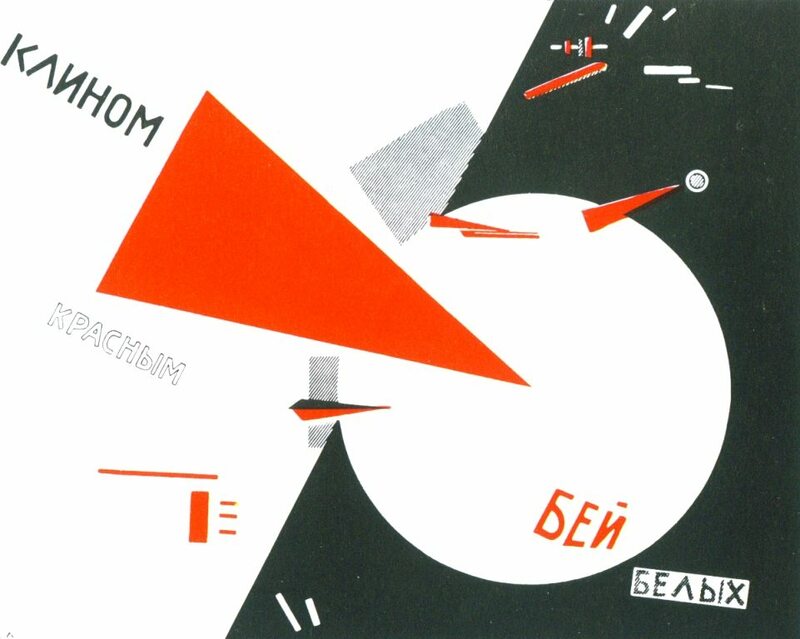 This movement not only influenced design and art, but also architecture, music and literature. Society began to develop new ways to shape human culture (art, music and literature) and improve the constructed environment (architecture). 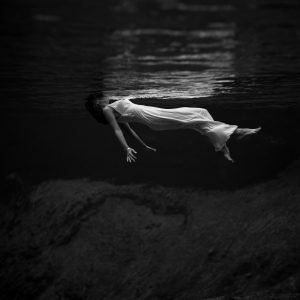 This photograph, of a woman in a gown floating in water, is a gelatin silver print shot by Toni Frissell. It was produced for the American women’s fashion magazine, Harper’s Bazaar. Frissell was a fashion photographer for Vogue, her major contribution to fashion photography was her development of the realistic, as opposed to the staged, fashion photograph in the 1930s and 1940s. Frissell is also well known for her usage of uncommon perspectives, and depictions/ illusions of elongated human forms. If I were to translate Frissell’s photograph into a sound, the design would sound like Jóhann Jóhannsson’s Flight From The City. As modernism is associated with innovation and progress, this track is described as ‘a meditation on beauty and the process of creation’. This track, from her record Orphée, features piano, electronics (the crackling sounds), violin, cello and a String Orchestra. The build up and addition of each instrument helps in depicting the feeling of change depicted in Frissell’s American Modernism influenced photography. Although there is softness and consistency in the pace of the instrumental, the slight build up to a climax compliments the composition of the photograph, the distribution of light and dark. The sound flows well with the movements in the photograph (created by the water and the figure’s pose). Furthermore, the elegance of the figure and the dress is matched well with how elegantly the track is composed. I chose this track not only because it perfectly describes Weeki Wachee Spring, Florida but also American Modernism as a movement, a movement about change and new technology. Eskilson, Stephen J. Graphic Design: A New History. Second ed. Yale University Press, 2012. Laurence. “Jóhann Jóhannsson Announces New Record Inspired by ‘the Orpheus Myth.’” The Line of Best Fit, www.thelineofbestfit.com/news/latest-news/johann-johannsson-announces-new-record-inspired-by-the-orpheus-myth. Scheim, Benjamin. “Jóhann Jóhannsson: Orphée.” Pitchfork, Pitchfork, 13 Sept. 2016, pitchfork.com/reviews/albums/22305-orphee/. “The Significance of American Modernism.” Ackerman’s Fine Art, 21 Sept. 2015, ackermansfineart.com/the-significance-of-american-modernism/. “The Easy Guide to Design Movements: Modernism.” Creative Bloq, Creative Bloq, 22 Oct. 2013, www.creativebloq.com/graphic-design/easy-guide-design-movements-modernism-10134971. “Toni Frissell.” International Center of Photography, 3 Mar. 2016, www.icp.org/browse/archive/constituents/toni-frissell?all/all/all/all/0. Pablo Picasso is the pioneer of modern art, and also a representative of western modernist painting. 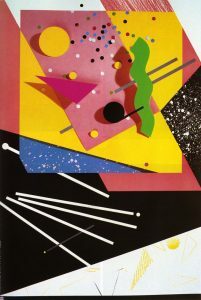 One of his artistic style, cubism, has shows a lot of features. The artist using plenty of geometric shapes such as cylinders, spheres, cones to deal with nature, trying to explore the beauty of structure and arrangement in those regular shapes. 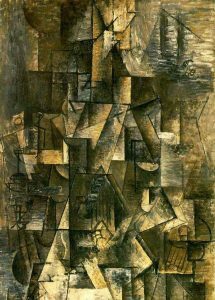 One of the most impressive achievement that the cubism created is to combine the different views of the object from multiple angles onto the same plane in the picture. In this art work “Ma Jolie”, It’s drawing shows a woman holding a guitar. Picasso separates the major elements of a figure drawing, and composed those pieces in one plane. It is very hard to distinguish the face of that woman, or the guitar, because those are completely abstracted by the artist. Personally, I really enjoying the tone of the whole painting,mixed with the dark green and brown, with a little bit light yellow in it, it makes me created a Scene of a old time dance hall, where the upper classes drinking wine, having a chat, and this painting is like a pop song at that period, played in the bar. The strokes that the artist used in this painting is really compressed. It’s like while you are playing guitar, the hand is flushing the strings, soft and elegant, without losing any consistency, which makes me feel relaxed. This art work really shows the effort of Picasso. By using this whole brand new drawing technique, to create a figure drawing, and shows a huge amount of movement in it. The magazine cover for Esquire in 1965 by George Lois is a clever combination of typically “male” process of shaving a beard projected onto a female model (image 1). For me, multiple senses are incited through this piece, most notably touch and smell. These senses are most likely emphasized because of the familiar feeling/sense/smell of shaving cream and the childhood-like knowledge of what it means. For me, I can smell the slightly minty fresh smell of the cream itself, as well the background context of the magazine and the time period it was made in gives the piece a slightly tobacco/cigarette smelling aura. For anyone who has ever shaved in their life (regardless of what body part) there is a distinct feeling of the smooth brush of a razor on cream, which is another feeling that is evoked when looking at the cover. 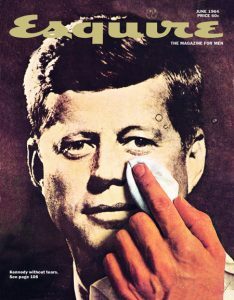 George Lois has been successful at combining other senses along with his visuals, and a good example is another cover he designed for Esquire, showcasing JFK (image 2) with a hand wiping away something on an image of him. It’s almost 3D and lets the audience also “feel” the picture. Breaking this wall makes these covers very successful and accessible pieces. There as interesting satisfaction and curiosity of these feelings that are evoked when just looking at a visual piece, and in my opinion, heightens its success. It makes the viewer want to touch the magazine and open it. The actual visual of the image as well as the physical sensation it instills a sense of comfort and curiosity within this piece of graphic design. Image 1: Esquire Covers by George Lois.” Magazine Designing, 2 Dec. 2013, www.magazinedesigning.com/esquire-covers-by-george-lois/. Image 2: Kapetopoulos, Fotis. “George Lois – Madison Avenue’s Creative Spark.” Daily Review: Film, Stage and Music Reviews, Interviews and More., 29 Apr. 2014, dailyreview.com.au/george-lois-madison-avenues-creative-spark/5416/. I want to focus on the sense of taste for this post. 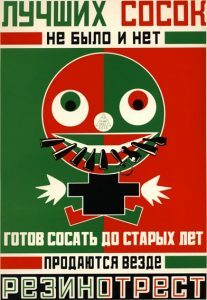 In the 1920’s Russia was transitioning from an agricultural country to a progressively more industrial one, in agricultural Russia people worked to get by, most growing their own food – that meant not eating (or living at all) in excess. For that reason I feel that this piece would taste like meat and potatoes, salt meat and boiled potatoes to be more specific. At this time in an agricultural area, most food would have to be either eaten immediately or preserved by pickling or drying. Salt was a common method of preserving meat, and potatoes can be stored for years in a cool dark place without spoiling. This meal would be quite bland, no extra seasoning – though this piece isn’t bland, rather it’s lacking frill, it’s got just what it needs and nothing extra.